TBT: The Dovells, "You Can't Sit Down"
Sometime in 1963 I was with the Robinson High School debate team at a tournament held on the campus of Florida State University in Tallahassee. The evening after we arrived, my teammates and I were in a student cafe, having burgers and cokes. The cafe had a juke box and a small dance floor. 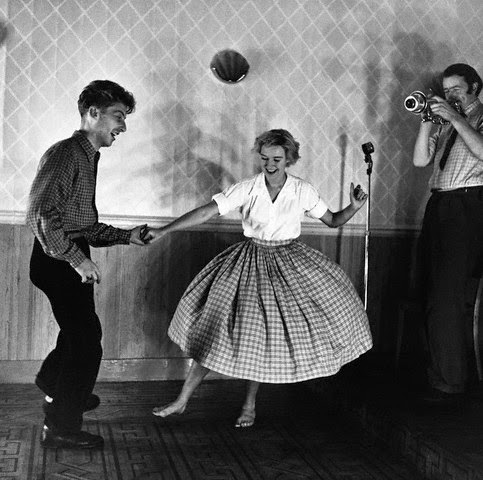 A couple looking much like those in the photo, except that the woman was wearing a tartan skirt and black-on-white saddle Oxfords with white bobby socks, got up; the man put a coin in the juke box, and a very lively tune began. The couple did a frenetic jitterbug with lots of twirling and, if I recall correctly, the man lifting the woman by the waist and swinging her around. .The song was "You Can't Sit Down," a '63 hit for the Dovells, a Philadelphia group whose biggest hit was "The Bristol Stomp" and who recorded on Cameo Records, part of the Cameo-Parkway group that was central to the Philly rock and R&B scene in the late 1950s through the '60s. The South Street Seaport Museum has been an important part of my life since I arrived in New York as a permanent resident in 1973. At that time, I was working downtown, in the Financial Distrct, and could see the tall masts of a square rigged ship from the offices of the firm for which I was working. This piqued my curiosity; four crossings of the Atlantic by ship during my childhood had made me a maritime buff. During a lunch break I walked over to the Museum and became a member. I later toured the historic ships, discovered its book and craft shops, and participated in many of its activities. 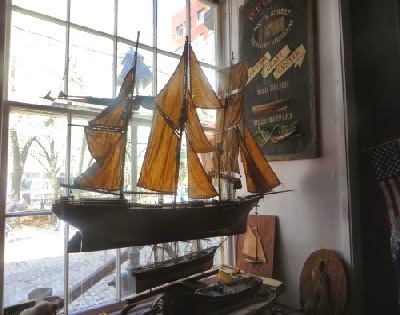 The Museum, though not its collection of historic ships, was seriously damaged by Hurricane Sandy, and for some time there was doubt if it could survive. Now its fortunes have improved. 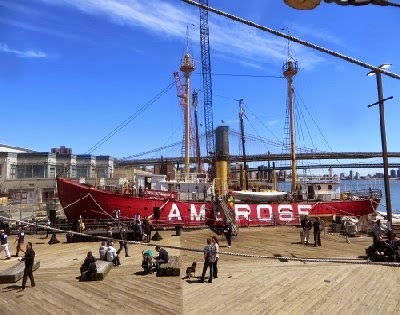 This past Saturday, April 25, I walked from my home in Brooklyn Heights across the Brooklyn Bridge to attend the official re-opening of the Museum's historic ship collection. Approaching the Museum on Fulton Street, I took the photo above, which could have been a scene from over a century ago. 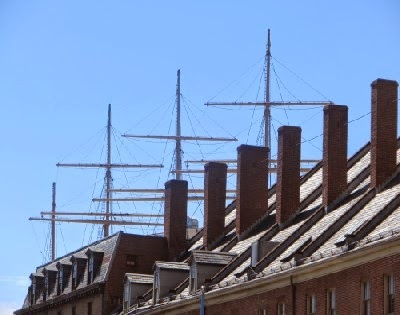 The masts of the barque Peking loom over the rooflines of Schermerhorn Row, a group of commercial buildings dating from the early nineteenth century, which now house the Museum's visitor center and galleries, along with several commercial stores. 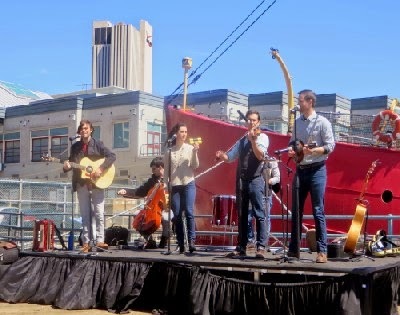 On Saturday there was a musical performance in front of Ambrose: lively folk music by the Lobbyists. 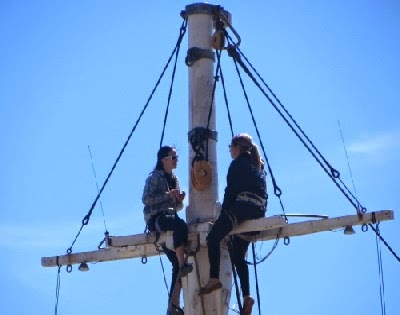 Two women were on the crosstree of the foremast of the fishing schooner Lettie G. Howard. 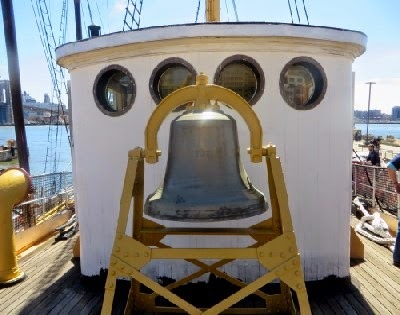 I boarded Ambrose and got this photo of her enormous bell, used to warn ships away when fog was thick. 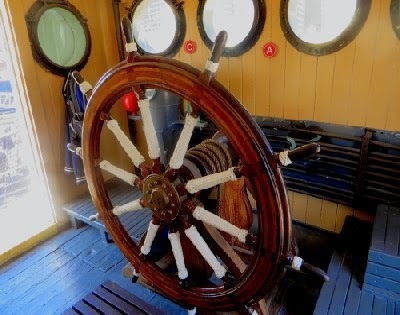 Going insider her wheelhouse, I got this photo of her wheel. This is Lettie G. Howard's bow, as seen from Ambrose. 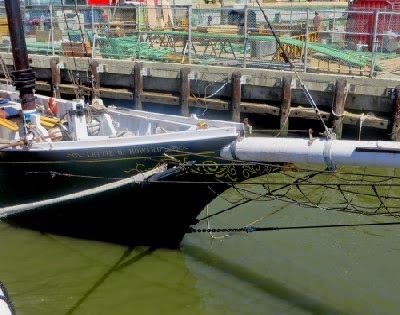 During her long career as a fishing schooner, she sometimes brought fish to the Fulton Fish Market, which was located at South Street. The market has since been moved to the Bronx. 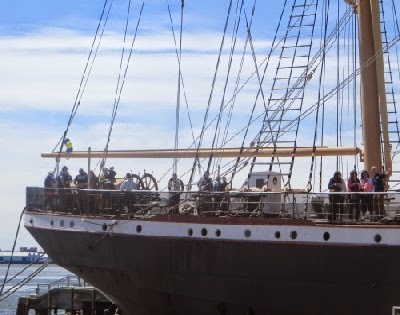 Lettie is now owned by the Museum, but shared with the New York Harbor school, which uses her as a training vessel. Also from Ambrose, I got this view of visitors on Peking's quarterdeck. 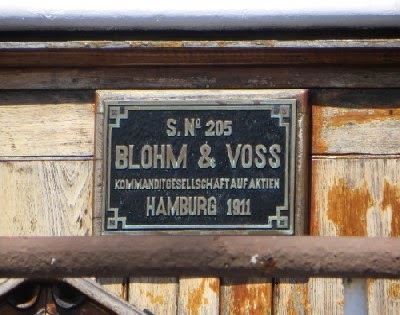 Boarding Peking, I saw her builder's plate, showing that she was completed in 1911 by the prominent shipbuilders Blohm & Voss of Hamburg. 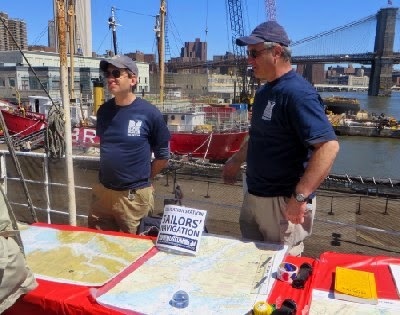 These two gentlemen were explaining the fine points of navigation on Peking's quarterdeck. On the table were charts of New York Harbor and its approaches. 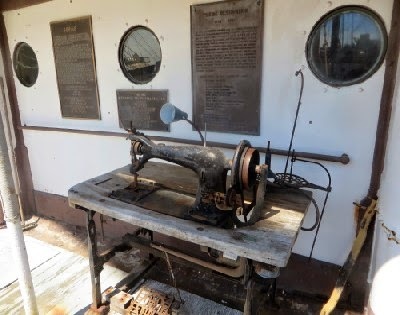 This is Peking's mighty sewing machine, used to repair sails. On the left is the Museum's working barge, used for ship repair duties. In the center is the schooner Pioneer, used by the Museum for harbor cruises. When my daughter was in middle school she took some instructional sails on Pioneer. 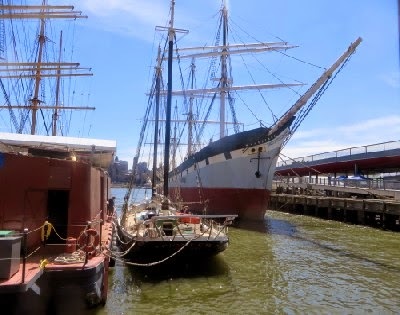 On the right is the square rigger Wavertree, which will soon be going into drydock for renovation that will allow her to be the centerpiece of the Museum's collection. After scarfing down a Korean beef hot dog, dressed with spicy kimchi, I took a walk back to Schermerhorn Row and the Museum's visitor center. 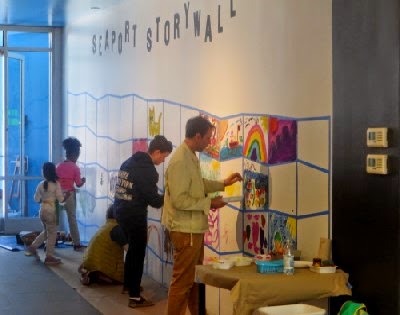 Here, visitors were invited to participate in creating a mural. As a regular Museum visitor I've known Jack Putnam for some years, as manager of the book store and craft shop, and for a time as operator of a ferry service the Museum offered from Fulton Landing in Brooklyn, near where I live, to the Museum's pier on the Manhattan side, near where I worked at the time. 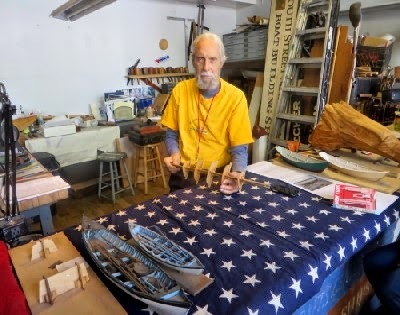 On Saturday I found him in the Museum's Maritime Craft Center, here holding the framework of a model dory he's making. Two completed examples are on the table in front. There were more examples of the modelmaker's art in the Craft Center's window. 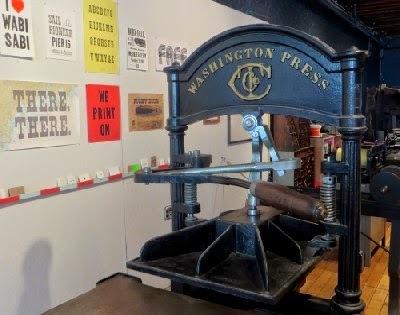 Next door to the Craft Center is the Bowne Print Shop, a restored 19th century printing establishment. The photo above shows one of its vintage presses. 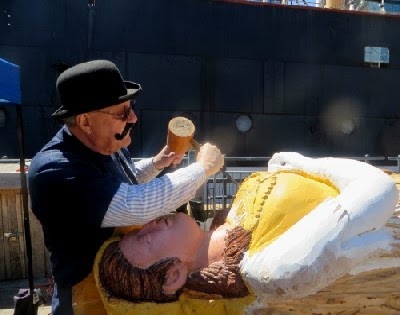 Jack mentioned to me that someone named Tony was on Pier 16 working on a figurehead for Wavertree. I went back to the pier and found him carving away. Captain Jonathan Boulware has served as interim president of the Museum for several years. On Saturday it was announced that he is now president. 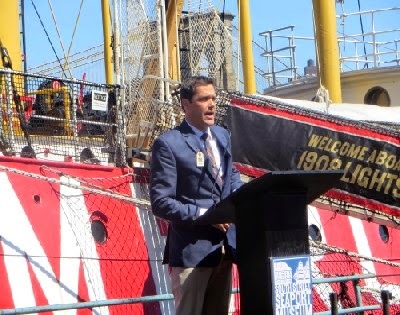 He read a letter from Mayor Bill de Blasio recognizing the Museum's importance in preserving New York City's maritime, commercial, and cultural heritage.